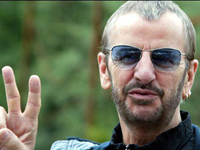 Ringo Starr, born Richard Starkey, was the drummer in The Beatles from 1962 to 1970 and thus one of the most famous musicians of the ’60s. Though the least prominent member of the quartet, he distinguished himself as an occasional singer of good-natured material and as an actor. Upon the group’s split, Starr went solo with two novelty projects: the first, an album called Sentimental Journey, found him covering pre-rock standards, and the second, Beaucoups of Blues, was a country music collection.